Beginning this summer, University of Chicago’s Place Lab, led by Theaster Gates, launched the nine-part Ethical Redevelopment Salon series, dedicated to “the process and values of mindful city building.” The theme of the first Salon was Repurpose and Re-propose; the theme of the second, Engaged Participation. The third Salon, with the theme Pedagogical Moments, allowed ideas and questions about the transfer of knowledge and social responsibility to emerge and inform the Salon process with new layers of inquiry and understanding. As a companion to the third Salon, Place Lab screened the 1970 film, “Lord Thing,” a documentary about the Vice Lords/Conservative Vice Lords (CVL), on Chicago’s West Side during the 1960s. The film’s multilayered narrative, including a dramatization of the gang’s history, shows the arc of a movement to redefine itself from a street gang to a non-profit organization focused on black empowerment and agency in Lawndale. CVL started black-owned businesses and the Teen Town community center. With funds from area corporations, they launched Operation Bootstrap to clear garbage and paint murals. They collaborated with the Museum of Contemporary Art to create the Art & Soul initiative, and secured community development grants from foundations, including the Rockefeller Foundation. In 1968, a combination of forces—starting with their alleged role in the riots that followed the assassination of Dr. Martin Luther King, which destroyed the Roosevelt Road commercial corridor, and the imprisonment of gang leaders by Mayor Richard J. Daley and Cook County State’s Attorney Edward Hanrahan—ultimately led the CVL to revert to their origins as drug dealers. Fifty years later, during the post-screening conversation, former gang leader Benny Lee, who spent most of his twenties in prison, described how gang organizing within prison maintained bonds of community. He noted, too, that the first Mayor Daley got his start as a head of South Side Irish gangs that organized and primed men for jobs in the Chicago police force. The following afternoon, Salon members visited Chicago’s Growing Power farm on Iron Street, located in the onetime Daley stronghold of Bridgeport. Erika Allen, the Chicago and National Projects Director and daughter of founder Will Allen, along with Quinten Bradley, a former student and now employee, gave us a tour of the seven-acre farm. Its hydroponic fish farming, hoop houses, vermin-composting and mushroom production systems, apiary and a family of pygmy goats are nestled in a mixed industrial and residential neighborhood. As described by Allen, the farm demonstrates that you can build food systems in urban environments where people live. “You can grow a farm on concrete and people of color can do this in a sovereign way,” she said. Along with growing food in four feet of soil atop concrete, Growing Power has reclaimed land that supports communities of color living within a system of food apartheid, in a place, historically, so notoriously racially intolerant that some black Chicagoans still refuse to go there. Fast forward to the Salon that evening. 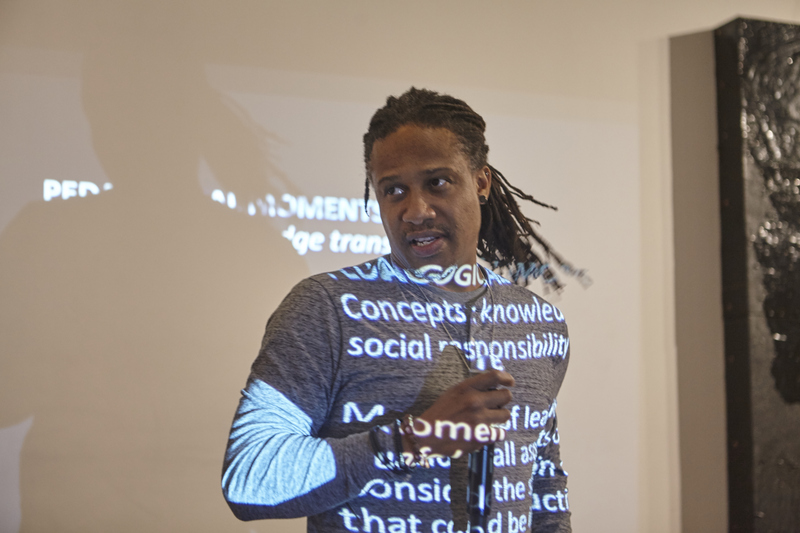 After an introduction by Theaster Gates, Steve Edwards, the series’ MC and Place Lab’s Isis Ferguson, the guest expert for the evening, David Stovall, took the floor. Dr. Stovall is a professor of Educational Policy Studies and African-American Studies at the University of Illinois at Chicago, and involved in UIC’s Great Cities Institute; he is also a volunteer social studies teacher at the Greater Lawndale/Little Village School of Social Justice. He talked about the junior high and high school students who are his experts, and how, in whole segments of the city, students of color are proscribed from the process of thinking and creating: they’re taught history in ways that are intended, not to enlighten, but to bore them; in ways that are designed to settle, not to trouble, the waters. “This is the way we talk about gun violence in Chicago,” Stovall noted. “We don’t complicate it.” And he described the moment Jody Weis, Chicago Police Department Superintendent from 2008-2011, said publicly that displacement is one of the key drivers for violence. “He let folks in on something we see in the day-to-day, but we don’t ask critical questions about,” Stovall said. Weis was gone from the department a few weeks later. 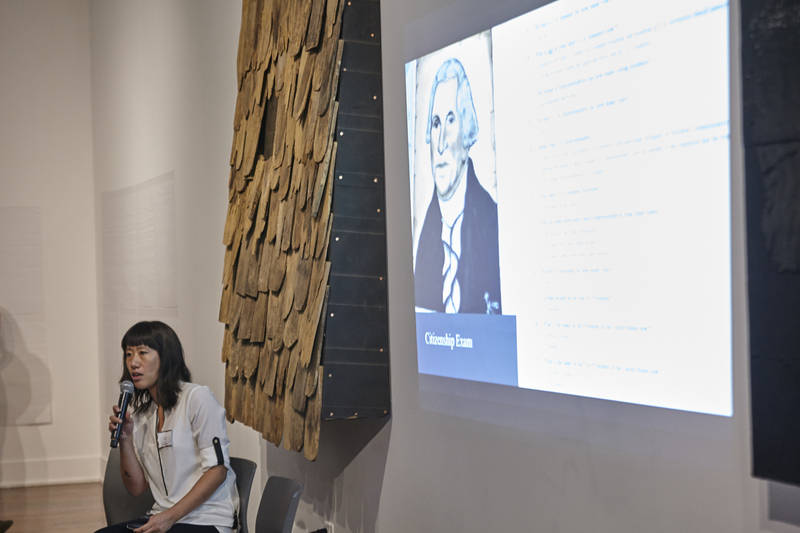 Carol Zou, who presented the Salon’s case study, is the project manager at Trans.lation, co-founded by Project Row Houses’ Rick Lowe and the Nasher Sculpture Center, in Vickery Meadow, an immigrant, refugee, African-American and Latino neighborhood in Dallas, Texas. Trans.lation is “a space of cultural freedom,” where arts and language classes allow residents to self-organize and build community. Pedagogy, in language and literacy, becomes political for new immigrants. An Arabic intern decided to paint all the US presidents, starting with George Washington, but when a black leader saw the painting, she asked, “Why is there a portrait of a slave owner in our space?” The incident illustrates how, through ESL classes and citizenship tests, the US assimilates new citizens in ways that neutralize events of US history, that continue to oppress and disadvantage US-born people of color, and that prevent new immigrants from recognizing and joining in solidarity with US-born communities of color to address issues such as gentrification, police violence and poverty. Toward the end of her talk, as Zou spoke of her work in service to individuals who dream into being stronger communities and a better future, her voice quavered. I know the feeling. I’ve spent my professional career writing about and advocating for people in struggling communities whose fortitude in the face of adversity and whose aspirations, easily canned as campaign rhetoric or campaign fodder, are very real. In the wake of the November 8 election that has cast such an ominous shadow, especially over communities of color, my own inner voice trembles with faith and hope that, moment by moment, together, we can and will continue to learn to dream into being a better future.